The recent years have seen a sudden craze towards modular kitchens. They are loved as they are more convenient, storage friendly and fashionable. However, with so many design innovations in this segment, it has become nearly impossible to choose the style that will suit the needs of a family. For instance, if you have someone in the family who suffers from lower body aches, you need to place cabinets in a way that doesn’t allow too much of pressure to the muscles while bending or lifting. Similarly, there are other guidelines, that if not followed properly, can turn a new kitchen into a blunder. 1) Initial Planning – Before you start modular kitchen design, you should have a clear idea on the placement of items. From the cooking, storage to the disposal area, everything should be planned in a way that is the most convenient for you. Ideally, all these three areas should lie equidistant to each other in an equilateral triangle set-up but can be tweaked according to budget, space and sensibilities. You can even keep the storage and disposal area in a line, if the work area occupies the center. 2) Proper Placement of Essential Items – Stove, sink, essential appliances and food items form the core components of your kitchen. Design your modular kitchen keeping in mind that these items need to be accommodated in the most functional manner possible. Additionally, each of these components comes with their own needs, like cleaning, maintenance, water and heat disposal and easy access. 3) Storage – One of the best advantages of a modular kitchen is a well-designed storage opportunity. However, while designing your aim should not be creating the maximum storage but optimum storage. Cabinets – You can choose from floor to ceiling pull out cabinets that make use of the depth of the kitchen counter. Overhead storage cabinets also make efficient use of vertical space. Keep in mind that there are several kinds of storage needs in a kitchen. For instance, a handy pantry for everyday ingredients, and a separate area for storing bulk quantities and items that are used only occasionally. The same principle applies to utensils and small electrical appliances. Sliding cabinets and corner units are some other efficient storage tricks. Drawers – The space under the counter can be utilised by using drawers, catering to different needs from placing the crockery ( size or usage wise) to edible items. Nowadays, you have drawers, allowing you to segregate items as well as optimize space using sliding partitions, racks etc. Appliances – Modular kitchens permit efficient use of space with regard to appliances by allowing you place them safely. Ovens offering both microwave and heat features are common. Grills that combine a stove top and grill oven are an excellent option too. Sink faucets come with rotating or flexible faucet heads, making their use that much more convenient. An enticing array of solutions is also available for racks and rails for sliding hooks to hang things. 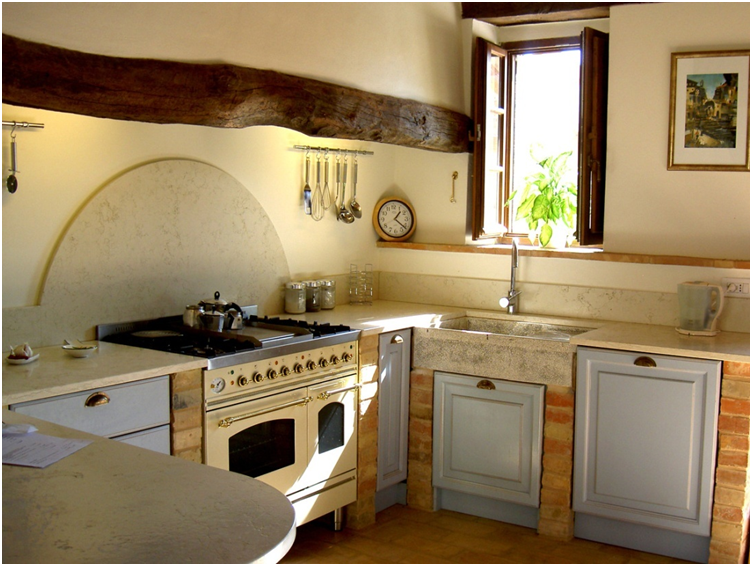 Granite and marble are the most common choices for work areas and countertops as they are rugged and easy to maintain. Laminates and natural wood are preferred for cabinets and drawers. Although most commonly seen in industrial kitchens due to the ease of maintenance, aluminum and steel are also good choices for both work areas and storage. They are available in a variety of colors as well. You should ensure that all areas and surfaces that are exposed to water and moisture are made of water-resistant materials like coated metals, plastics, or special purpose boards. Plan your available power outlets when adding appliances that run on electricity. If you are building a new home, you can design the power outlets around your kitchen layout, but if you are remodeling an existing space, you will need to factor in how to best draw power to your appliances. Lighting for the kitchen is often neglected. Ensure that the main work area has an adequate supply of light, both natural and artificial. Cabinets that are deep and away from the main source of light may need internal lighting that can be turned on automatically by the door opening. Remember that kitchen appliances often draw a lot of power. Check your wiring to be sure that it can take the load. Appliances that give off heat or steam should be placed where they do not spoil the surfaces, stored items or other appliances.